My oldest daughter and her husband bought a house a few months ago. So far, they only have temporary curtains or shades in their windows. 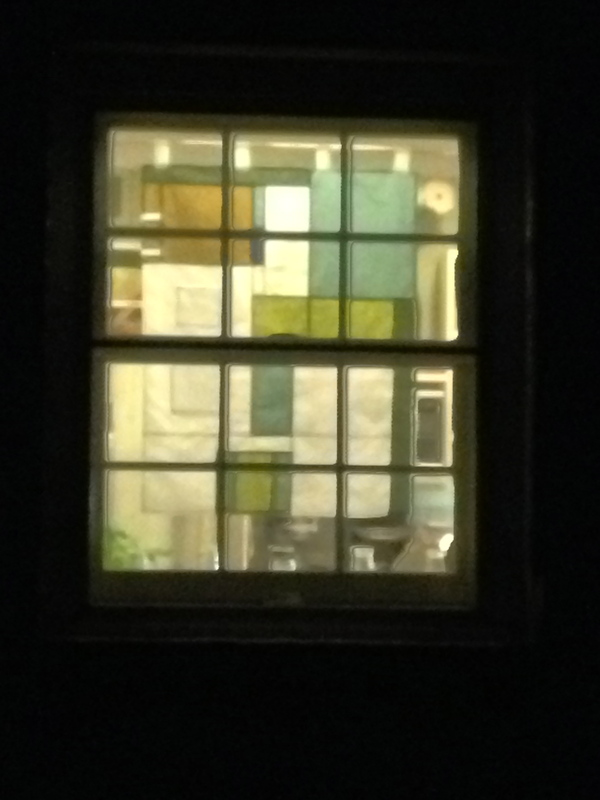 Their kitchen window faces the street. It is nice to work at the sink and look out but it seems as though there should be some kind of curtain there for privacy. 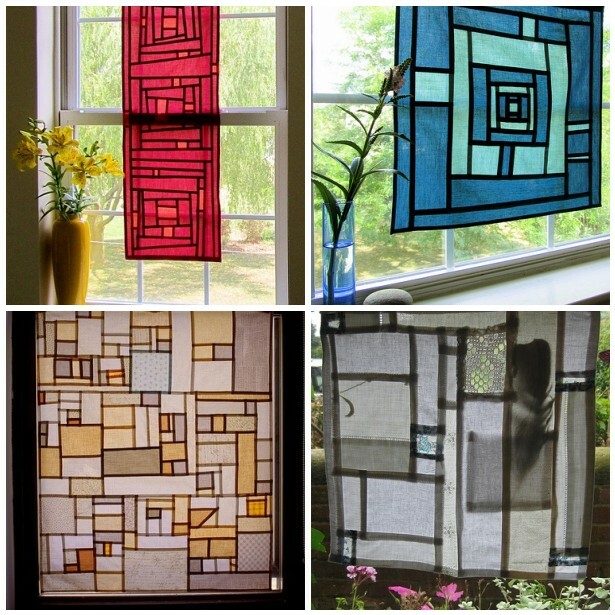 This is not a huge issue because of the size and position of the window, but it got me thinking about a decorative sheer panel curtain and a technique I’ve recently seen called pojagi. Have you heard of it? 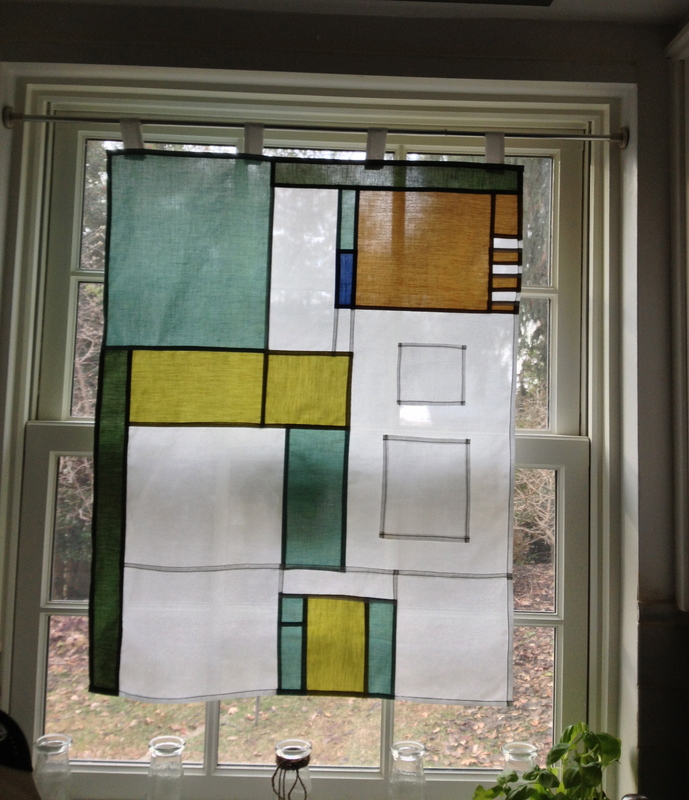 My friend and quilt guild cohort, Dianne Miller Wolman, made this fun piece that hangs in her home. She made her piece with a hand sewing technique. Below are some examples that I found on Flickr. Click on the title in the caption to go to the original photo and to learn more about these pieces. Victoria Gertenbach who blogs at The Silly BooDilly and who made the red “curtain” below (#1) has a great tutorial for pojagi using the sewing machine. Pojagi or Bojagi is a Korean patchwork technique where the seams are finished on both sides. Historically these pieces were used as wrapping cloths. Essentially the seams are flat-felled. You sew each seam with the fabrics laid out in a staggered manner such that the top fabric’s seam allowance is 1/4″ and the bottom is 1/2″. 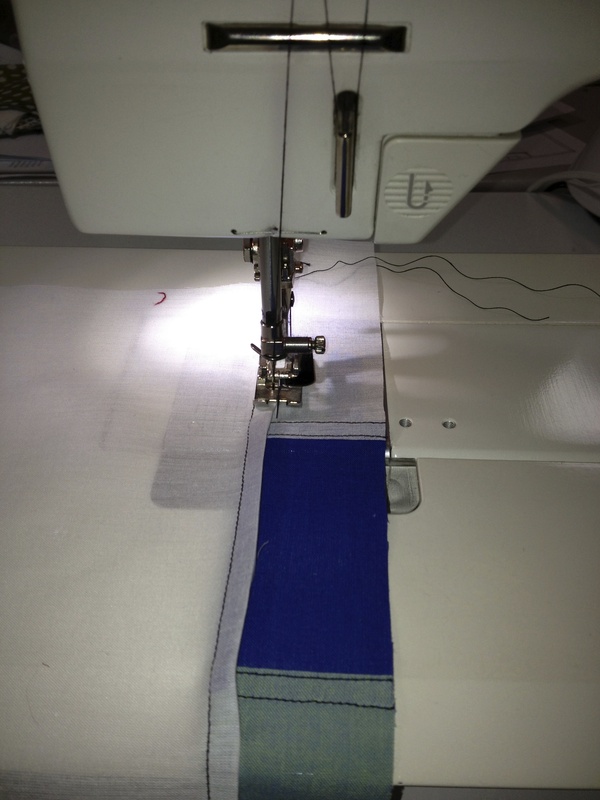 Each seam sewn first with a staggered seam allowance. Next, the wider seam allowance is pressed over the smaller one and that whole seam is pressed flat with the raw edges all encased. Encased seam is then edgestiched down. I read that traditional pojagi is done by hand and with a contrasting thread color. Most of the contemporary examples I’ve seen have used matching thread but I decided to go ahead and sew my piece with a bold black thread. 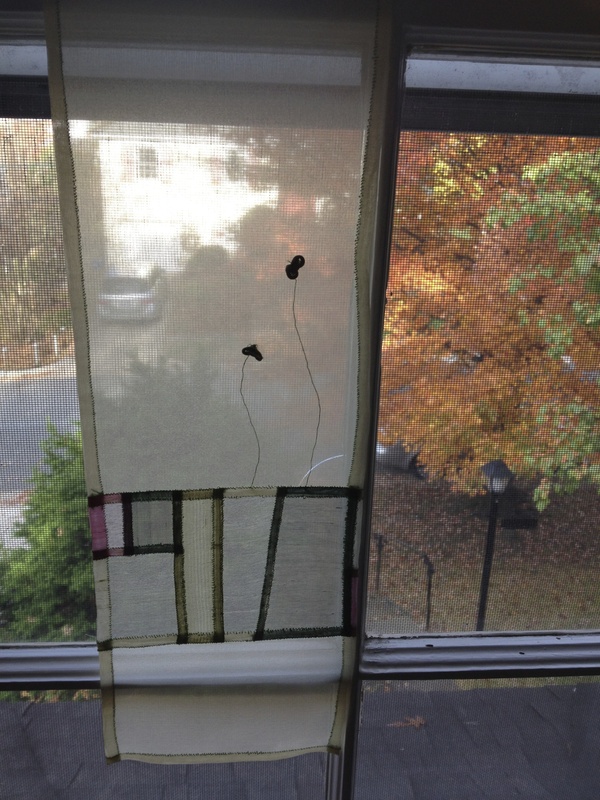 The curtain is completely reversible but on the regular seams one side shows one black thread line and the opposite side shows two. Once I had read up on this technique, I wanted to plan my design. Most pictures that I found online were very log cabin-ish. My daughter is an engineer for a construction firm and her husband is both an engineer and an architect. My younger daughter made a comment that if I did a log cabin design for them I had better do it with straight lines – that they would not care for a “wonky” log cabin! For some reason, this got me thinking about their floor plan. I knew that my son-in-law had a digital version he had made up to play with the placement of their furniture. We had used it to calculate the square footage of their walls to help with knowing how much paint to buy to cover the walls. Could I use this? 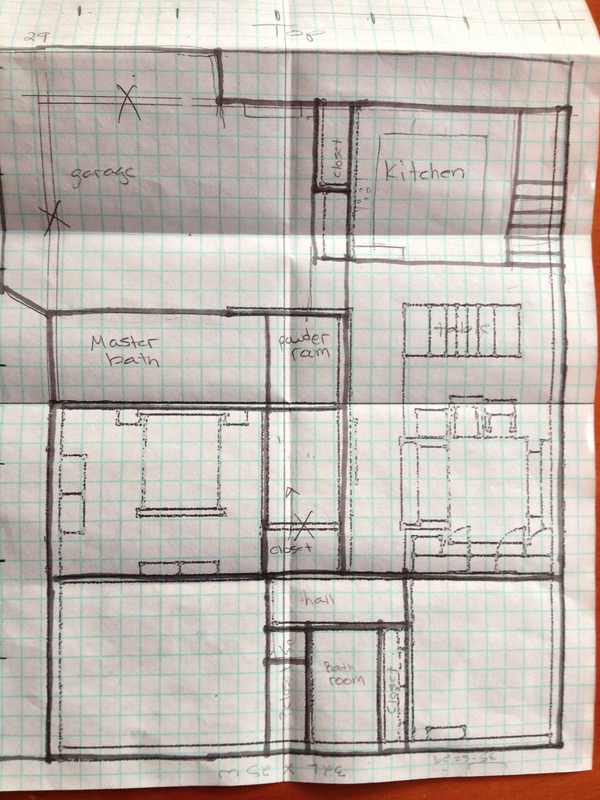 I copied it on to graph paper and filled in some walls that were missing – like the whole garage! And so . . . take a look at my curtain again . 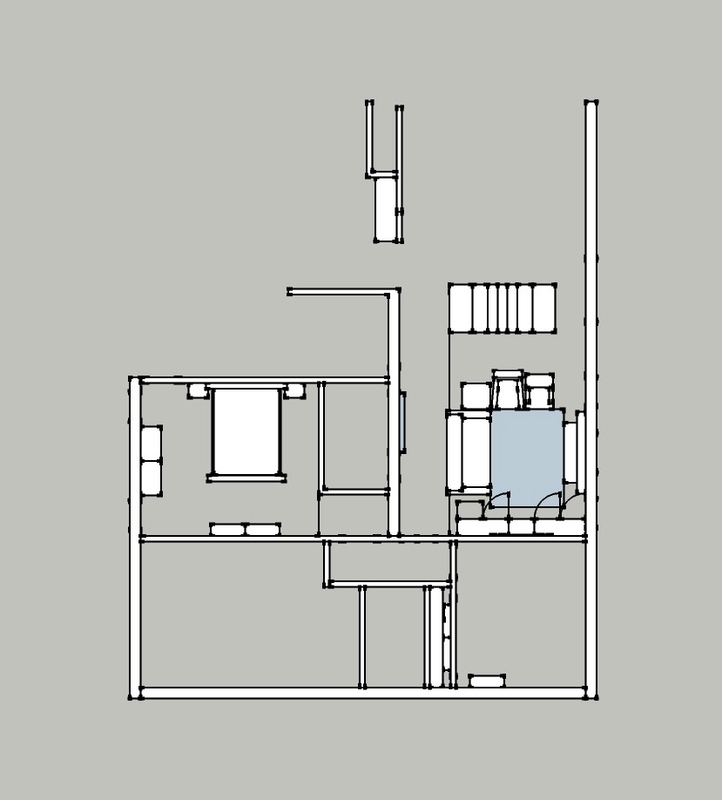 . .
Would you ever guess this was a floor plan? I love how it looks from the outside at night too! Thank you Jan. It is pronounced with a hard G (like the first g in garage). Here is a youtube video that has the pronunciation and a good demonstration of sewing it by machine. It is fun to sew and would also make a wonderful scarf. I’m excited to do more in the future! It looks like a stained glass window. What a neat technique. You found just the right fabrics. Your daughter must love it. How did you “find the time” to complete it ( having just bought the fabric last week)? I had the design completely worked out before I bought the fabrics. Several days before Christmas I spent an entire day sewing it together. I enjoyed every minute. There is just something satisfying about putting a single layer together and hiding the raw edges as you go. 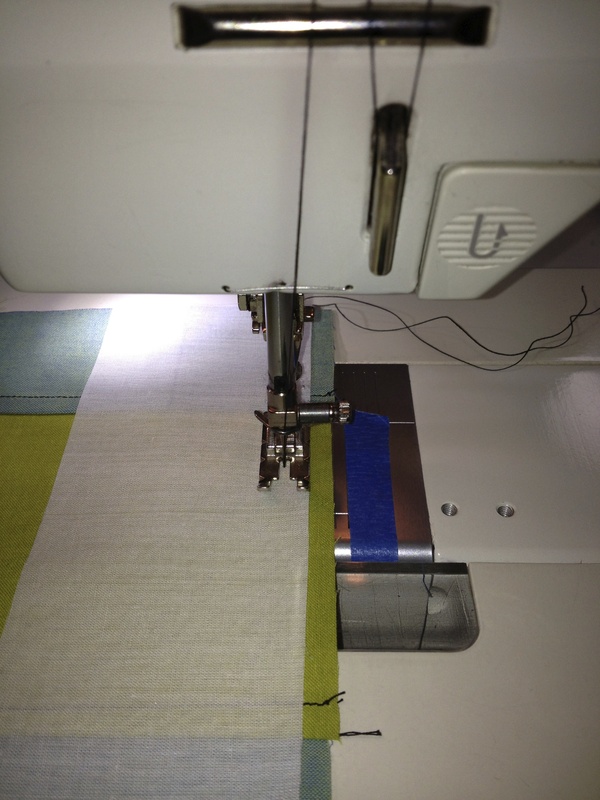 I had to keep switching back and forth between my 1/4″ foot and my edge stitch foot. When I do it again, I will actually consider setting up a second machine (since I have one). It’s so easy to change the feet, but I can’t tell you how many times I’d put the 1/4″ foot back on and forgot to change the needle position back to center. Luckily I didn’t step on the foot pedal too hard so the needle got caught up instead of actually breaking. That is so clever! And it looks so nice in the window. Meagan surely gave good insight for you and you turned that into a work of art! Thanks Carolyn! It was really a fun and interesting project to sew. I can’t wait to see it hanging in the kids kitchen window….a special gift for them. Your bojagi is beautiful! I fell in love with the craft while living in Korea and learned the traditional way of making it by hand, but using a machine is much faster. Many of the pieces found in gift shops are machine made. If you are interested in learning the traditional method, Youngmin Lee recently produced a How To DVD. Check out her blog at . Pojagi curtains are in just about every home i went to in S. Korea, which is where I fell in love with it (and also with Korean decorative knots: medeup). I’d love to learn how to do this myself. What kind of fabrics do you use? Can you get it in any fabric store, or are they only in specialty stores that you can recommend? My version of the Pojagi curtain is not traditional. In Korea they often use materials I don’t think we can source easily in the US and they sew it by hand. 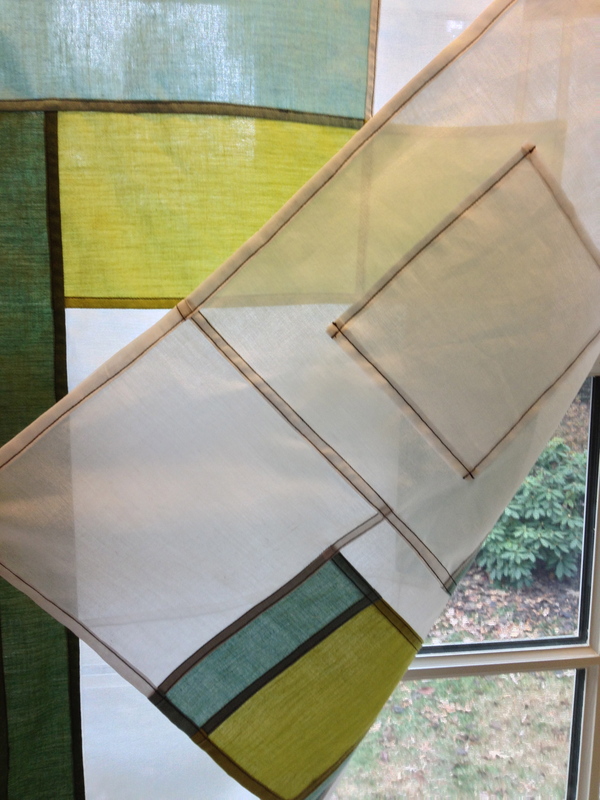 I used a light weight shot cotton that is transparent enough when held in front of the window that it worked quite well and was easy to work with using a sewing machine. Any quilt fabric store has these types of fabrics in a wide range of colors. Best of luck, if you give it a try! Wonderful! Something new to,me in art. And a graphic silk quilt of their home. I’m going to try it.